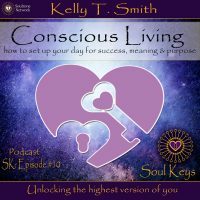 Join Kelly T. Smith in episode 10 for conscious living. In this episode, you will go on a journey of self-awareness taking note of all of your daily activities. How do you spend your time, money resources and energy? What do you do to take care of yourself and how do you wake up to self-love, self-awareness and conscious living! In what ways are you unconscious or are you living your life on autopilot. Key # 1 What does becoming conscious mean? Kely #3 Discovering your need, desired and living a life of purpose! Kelly T. Smith is the Author of the best selling Intuitive Life Coaching Oracle Cards App and the Guiding Light Oracle Cards App and a Mind, Body & Wellness Practitioner with an Associate of Occupational Studies Degree in holistic health care with a concentration in Mind-Body Transformational Psychology. She also holds a certification in Life Coaching & Hypnotherapy. She has been trained in a variety of holistic healing modalities as well, such as: NLP, holistic nutrition, past life regression therapy, homeopathic remedies, essential oils, psychology of intuition, energy healing and many others. Her mission in life is to help you realize your fullest potential, find your hidden gifts and break free from limiting beliefs that keep your true self hidden. She offers one on one sessions & intuitive readings via phone and skype as well as group coaching and online classes. Follow Kelly on facebook for daily readings! Download The Guiding Light Oracle Cards APP!